It is fairly well known today that talking to customers is a very important part of developing a successful business. I recently spent a few days exchanging emails with customers and potential customers, discussing what they liked about WP App Store and what they didn’t. For most people, the biggest issue was our lack of plugin selection. We’ve recently added a few new plugins to our listing, but we’re still only up to 18. Several people also mentioned specific plugins were missing like Gravity Forms, Backup Buddy, and WP Touch Pro. Others suggested that we add many of the great free plugins from WordPress.org and dial down the marketing in the plugin listing. 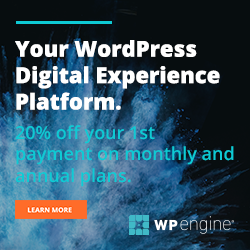 As this is the #1 issue, we have been working hard on this and are close to launching a revamped plugin listing including hand-picked free plugins from WordPress.org. We’ve also heard from Gravity Forms and Backup Buddy, that they will be adding their products soon. Most of the people I reached out to were developers and many of them said that they already had a developer license for most of the plugins we were selling. They also said they were only interested in buying developer licenses, which we don’t sell. We’ve actually already launched the ability to add multiple licenses per product, so it’s now up to publishers to add the other licenses for their products into our system. Another common piece of feedback was that the experience browsing our product listing was poor. Also, you had to install the plugin before you could browse and there was no search. One customer specifically mentioned they would have liked to search for “responsive” themes for example. We have already added search functionality and have made our product listing available on this web site. See Chris’ detailed post on public product pages. For most of these issues, we had already started working on them or scheduled them for the near future. But what I didn’t expect was how empowering it is to hear it from customers. Not only does it confirm that our best guesses are on track, but also helps us better prioritize the issues, tackling those people find the most painful first. Customer development is a wonderful thing.